Mr. Montaldo, Cantieri di Sestri (Sestri Boatyards) are renowned for their workings in iron, aluminium and wood. This allows you to work on all types of boats, particularly on vintage boats. We know that you are currently finishing an important restoration; what is it exactly? We have been responsible for the restoration of a prestigious "bialbero" (twin mast) of 32 m. The boat arrived at our yards in October 1995 after a number of charter seasons in the Red Sea. It needed maintenance work, not particularly substantial, for the refurbishment of the deck and the interiors. During a period of mooring, the craft was completely damaged in an arson attack, and remained under seizure for investigations by the Judicial Authorities for many months. After being released from seizure, it was sold first to a Monegasque boat owner who paid "its weight in iron" as a wreck. 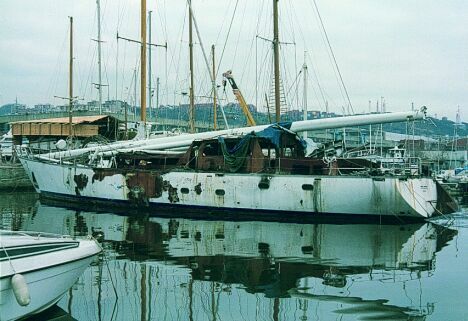 The new owner, after beginning reconstruction work on the structures, died prematurely leaving the hull in a state of abandon for another three years. How have you carried out the restoration, and with what financial resources? A French boat owner decided to buy the boat and to embark definitively on a total restructuring programme which, after two years, is about to be completed. Today the boat is registered as a "charter-yacht" in the French commercial shipping register and has received the "Bureau Veritas" certification and classification. What are the materials making up the hull and how has the reconstruction of the seriously damaged parts been carried out? The quick work is in steel while the deck and upper works are in aluminium. A number of skin plates have been replaced since the radiography and ultrasound tests on the welding were of concern to us. The deck and the masts have been almost completely reconditioned. When will this maxi-yacht be launched and what is her name now? 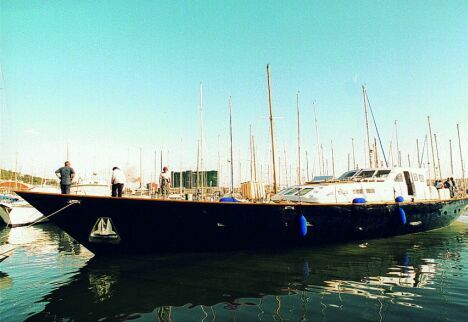 The boat was built in 1979 to a design by Giorgetto Magrini in the Ortona Navi Boatyards, being the last of the "maxi's" produced with this name before Perini started to make its own hulls in those structures. The boat was born with the name "Toy" then "Toy Wind", and today "Bartabas". How has the reconditioning of the boat's interior been carried out? Has the boat owner followed your advice or has he decided the interior furnishings on his own? All the phases have been supervised by a person entrusted by the boat owner, who is very knowledgeable, and who hasn't obstructed us in any way in our work. With regards to the choices made under deck, the boat owner wanted to give the interiors a decidedly personal character, based moreover, it should be said, on his excellent aesthetic taste. What have been the problems to solve in the delicate restoration of such an important boat? On maxi-yachts of this size, the technical aspect is truly complex. The boat has been rebuilt with state-of- the-art safety criteria and really interesting technical solutions, able to guarantee high level performance and a considerable range. Another difficult aspect has been related to the logistics. Making so many firms work together, operating at the same time, trying to respect working times, hasn't been easy. With a touch of immodesty, I can say that our experience and habit of managing operations at such a high level, has certainly played to our advantage. A last question of an "operative" nature. In the light of the start of work on the creation of Tourist Port in Sestri Levante, what do you think of the executive project and the repercussions on your activity? Finally, after about fifteen years of words, we come to the facts. What concerns us most is that this work may obstruct our activity, even though we've received ample assurances on the part of the Port Authority. Looking to the future, we can't but be happy with the fact that the "Sestri Marina" will become one of the largest landing places in the Mediterranean, with 2,300 boat places and three large boatyards that will manage part of the land areas. This is not to forget the business generated by other small commercial activities that will contribute to increase, in quality terms, the range of services offered. Cantieri Navali di Sestri; via Cibrario 3; 16154 Genova; tel. +39 010 6512476; fax +39 010 6512282.